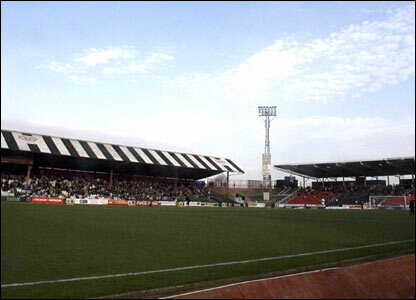 En route to St Mirren Park, I must admit that I felt somewhat sad that Ode to the Wee Red Book would never get to visit Love Street – St Mirren's home from the late 19th century to 2009 and one of my favourite grounds to visit as a youth. However, as with many of the teams in this country, forced stadium change took place in 2009 as the Buddies shifted themselves down the road to their new, purpose-built home, with a shed load of supermarket cash in their back pocket and a bright future ahead, debt free. Arriving at Paisley St James station, it was immediately clear St Mirren Park must be one of the most accessible grouds in the country – it was less than a 3 minute walk – and a nice little piece of kit as well. The exterior of the stadium has a few nice touches. A "You Are Here" map guides visitors around the ground, in case you get lost. Ticket offices are sensibly spread out with a home office, away office and ticket collection office all open on match days to prevent the sort of horrendous crowding you get at some SPL grounds. Oh, and there's even a set of 5-a-side pitches just behind the North Stand which were being used by the U-14s team as people were arriving at the ground. Immediate feelings about the place were quite positive. I entered the stadium via an unmanned turnstyle - barcode readers scanned my ticket and automatically opened the barriers for me...nice touch - and what struck me about St Mirren Park was that it still very much had a new feeling about it, with everything still in extremely good condition. Even the stewards looked bright-eyed and bushy-tailed. A far cry from the ones at say, Queens Park, who I remember looked like they went back into caves at night-time. Moving away from the stewards before they (falsely of course) identified me as some kind of luminous jacket pervert, I took my seat in the Main Stand and settled into my surroundings and, you know, it really was very comfortable indeed. Three other tidy new stands sat around me, the pitch was in fantastic condition and....what's this? A Panda Bear? No wait.....TWO PANDA BEARS! Could it be that Edinburgh Zoo decided to rent out their Pandas to the nation's football teams to cover the costs?! Pie and a tea - £3.55. Pie, absolutely superb. One of the best i've had at a ground. Tea? Not spilt on my hand - I don't even remember how it tasted. After last time's disaster at Firhill I was pleased to get out of it without burns. The main headline on the catering from is that you get FREE BEANS with all hot meals. Yes, ladies and gentlemen, you read right. 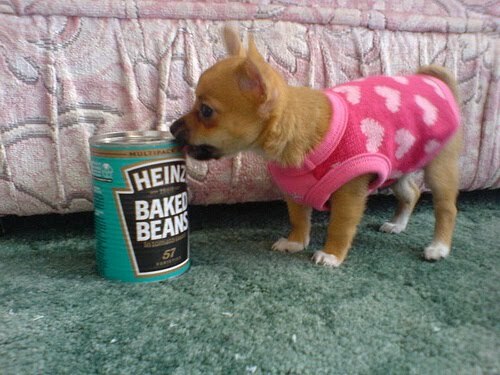 St Mirren offer free beans with all hot food. What an absolute treat! For those of you who don't like baked beans? Good! More for the rest of us! I was mistaken. The home fans are a very patient lot who expect a great deal of their team but, at the same time, have no delusions of grandeur. On this evidence St Mirren fans seem like a knowledgable set of punters who expect good football from their beloved players - that'll do for me. There was also a nice mix of older fans, groups of lads, groups of lassies and....as you can see from the below picture...what I initial thought was a stand full of midgets! Turns out a hell of a lot of tickets were handed out to local school kids ahead of the match. A bit disappointed. I'm yet to find a stand full of midgets in my travels. Thoroughly pleased with everything else, I was hopeful of a high-scoring, action-packed game of football. Well, I didn't get high-scoring, but this is certainly one of the best 0-0 draws i've been to in all my time watching footie in this country. The home side, who have been highly praised for their entertaining style this season, did struggle to get to grips with the physical challenge of their visitors. At times, they were bullied, battered and thoroughly unsettled by a Hearts team who, I feel had the better of the game on the whole, without creating much in the way of chances. There were some glimpses of what everyone has been raving about - particularly on the counter attack and in the last five minutes of the game but overall, it wasn't to be on this day. Enjoyable nonetheless. The main man for the home side in the first half was captain Jim Goodwin who....well...I won't mince my words.......is an absolutely lunatic. I mean this is a good way. He won everything in the air, never misplaced a pass and was the main reason that Hearts didn't completely run over the top of the Saints in the first forty-five. In the second half, I was impressed with Graham Carey who played wide-left for the Buddies. Excellent distribution, seemingly two footed and very skillful, the boy is a talent...no doubt about that. Other than that, I don't think some of the home side's more entertaining players - Paul McGowan for example - were allowed to play because of how Hearts restrictred St Mirren, but he also showed enough to suggest he's got something about him. The value for money judgement on this one is actually quite easy for me. Although I did pay £20 to get in, I found St Mirren Park and St Mirren as a team considerably more entertaining and worth the dosh than the smaller entry fees I paid to see Raith, or Ayr, earlier in the season. An impressive stadium to watch football in, entertainment on the park via the players, entertainment off the park via the Pandas and, did I mention the FREE BEANS with all hot food?! Good effort from St Mirren and an excellent support experience. People need to get along and see the Buddies!